If you are looking for spiritual guidance, please leave your contact information and we will be delighted to get back with you. If you are seeking comfort and healing, you've come to the right place! Christian Science, like all Christian religions, is based on the Holy Bible, including the words and works of Jesus Christ, upon whose life our church is centered. Students of Christian Science study the Bible every day. They also study another book daily, one which helps to cast additional light on the Bible. That book, Science and Health with Key to the Scriptures, was written by Mary Baker Eddy in the 19th century, but just like the Bible, the words of this book are timeless. These two books, the Bible and Science and Health with Key to the Scriptures, are the Pastor of our Church. This is a Pastor with whom you can consult and pray wherever you are and whenever you need to, even in the middle of the night. The Pastor's comfort and healing are always there for you. If you are interested in watching videos that tell how students of Christian Science have put their prayers into practice, please click: www.christianscience.com. If you need a spiritual pick-me-up day or night, you can click on Daily Lift on that site for a two-minute inspirational message/podcast on a different topic each weekday. 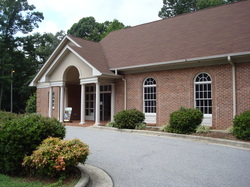 We also offer a Facebook page where you can follow us at First Church of Christ, Scientist - Salisbury, NC. And for teens and young adults, here is a link to an interactive web page where you can start your own journey in learning about Christian Science: http://www.time4thinkers.com/. Please click on the other links on the top of this home page to find information about how you can buy a copy of the Bible and/or Science and Health with Key to the Scriptures at our Reading Room; about our Sunday Church services and our Wednesday evening testimony meetings; about our Sunday School for young people up to the age of 20; and for information on where we are located and how you can find us.